Keynote Speaker, consultant and trainer, Tim Breithaupt has an innate ability to connect with his audiences through his lively blend of sales logic, simplicity and humour. Tim is an expert in teaching others how to effectively communicate with internal and external relationships. He believes that challenging conversations and difficult attitudes present an opportunity for growth and improving organizational and team relations. Tim breaks down the four types of communication styles to identify how to listen, negotiate and communicate for success. Supported by his twenty-eight years of sales training experience, Tim understands how sales applies to different industries and is able to teach his strategies specific to each audience and their sales environment. With a Commerce Degree from Ryerson University, coupled with thirty-five years’ experience in the business community, Tim’s passion to deliver real-world wisdom to foster a level of sales confidence that will boost sales results to exciting new levels. Tim Breithaupt has worked with numerous companies sharing his unique formula of sales success with thousands of professionals. Tim has consulted and delivered seminars/workshops and keynotes to TD Bank, Petro-Canada, The Fairmont Hotels, Baker Hughes, Scotiabank, Volvo Trucks, McCain Foods, IBM, Telus, ING and the Royal Bank. 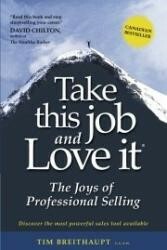 Tim Breithaupt authored his first sales book, Take This Job & Love It; The Joys of Professional Selling. Take This Job and Love It reached Canadian Bestseller status within a year of publication. Take This Job & Love It assists people to become confident and passionate and thus more effective in an increasingly competitive marketplace. Take This Job & Love It has rare endorsements from notable authors such as David Chilton (The Wealthy Barber), Jay Conrad Levinson (Guerrilla Marketing) and Brian Tracy (Advanced Selling Strategies). Tim Breithaupt is a professional member of the Canadian Association of Professional Speakers (CAPS). He is a past President and was the 2003 recipient of the “Speakers Mastery Award”. As a leading expert in the area of sales development, Tim Breithaupt has been published in local, national and international publications. Winning Attitudes has proven to be a very popular topic among professionals. Attitude drives skills and is one of the core proficiency that is essential for success. This keynote address and/or workshop recognizes the importance of a positive mental attitude and delivers specific, tangible strategies to foster personal and professional growth. This presentation is humorous, entertaining and educative. Having a winning attitude is the cornerstone of your success. Properly understood and embraced, a positive approach can enrich your personality and the impression you make on others. A deeper appreciation of attitude may cause you to change your outlook and enthusiastically join the ranks of those who consider attitude to be their most priceless possession. Research continues to validate that it has a compelling impact on your level of success. It empowers you to achieve new levels of productivity in your professional and personal life. Poor listening is one of the biggest problems facing people today. Research reveals that we listen at about 25% of our potential. Businesses and relationships rely on clear, concise communication. This program discusses the challenges of effective listening and delivers concrete, easy to implement ways for improvement. This humorous, interactive keynote presents the first step in improving relationship skills to become a better listener. When you are talking, you will only hear what you already know. When you listen, you learn what you don't know. Hence, communication skills are the cornerstone for every relationship. This highly customized program will improve both internal and external relationships by providing key communication essentials, effective listening skills and showing the importance of understanding and adapting to the needs of others. Understanding personality style types is proving to be one of the most useful tools in business and relationships. This program presents the four styles and instructs how to identify and adjust (not change) to different types of people. This humorous, interactive keynote will help each member of the audience understand their own preference and develop strategies in dealing with different people. "Lead, follow or get out of the way!" Although similar, leadership and management are different. Leadership goes far beyond management. Leaders inspire others to achieve their best and model people by utilizing their own energy and initiative. This keynote presents the areas of paramount importance for managers including: communication, coaching and diagnosing individual needs. Your success at work and home depends on your ability to relate well with others. However, people problems tend to take the greatest toll on us personally and professionally, disturbing our sleep and elevating our stress. The objective of this humorous, engaging keynote is to mitigate people problems by learning the four communication styles to build honest, productive relationships, and foster a quiet confidence to get in sync with co-workers and clients. To that end, you will learn the four behavioural styles of clients and comfortably identify and adapt to their preferred style. Communicate and connect with others by showing respect and accept the diversity of internal co-workers and external clients. Style-Flexing, the ability to adapt your style to other styles, is a proven method of respecting another person’s process of doing business. People are not difficult, just different. For twenty eight years Tim has partnered with fortune 500 companies sharing his insights to building stronger, long-term relationships. After you have completed a short questionnaire, Tim uses humor and logic to address the main attributes of the four styles. These insights will elevate your confidence to speedread clients and adapt. His signature training style is referred to as “enter-train-ment”, a lively blend of logic, simplicity and humour. Synchronized Selling: Five Ingredients of a "Yes". This keynote and/or workshop will be customized to deliver the competencies of professional selling and provide the five fundamentals as well as new techniques to stimulate sales effectiveness. Learn how to improve your close ratio and confidently navigate through the entire sales cycle, guided by the five rites of passage. Tim leans on his thirty years of selling and managerial experience to position audience members into real-world wisdom and current selling strategies. Confirming does not happen in isolation from the total sales process. Closing is not an isolated event which gets plugged into the sales cycle at some magical moment. Customers want to be nudged along in a natural and trusting flow. Tim’s presentation will identify the importance of building trust throughout the entire sales process. He explains the competencies of professional selling and fosters sales confidence to effectively navigate from the first sales call to closing the deal. How? By focusing on the customer. It’s a matter of synchronizing your selling agenda to the customer's buying agenda. Synchronized Selling builds a better understanding of ingredients of successful selling and serves as a strong foundation for sales success. Selling today is about loyal relationships and satisfying customers' conditions of satisfaction. Don't simply outprice your competition. Outsmart her/him. Tim's keynotes and workshops offer a lively blend of simplicity, logic and humor. They are content-rich and coupled with real-world wisdom. Quality service can give companies a competitive advantage. Service is being the perfect host; customers must feel welcome and treated as guests. This presentation shows audience members how to exceed customers' expectations, understand the service cycle and deal with different customers. This lively and stimulating keynote followed by an interactive workshop will leave the audience stimulated to take positive action and avoid lip service. Expect to learn about the framework for improving front-line service. Each individual has a personal impact on the customer's experience and this, in turn, stimulates awareness into positive action. Taking action is the most powerful statement one can make - it's the difference between customer service and lip service. Out-service your competitors and learn valuable tips for good customer loyal relations. Customers today are tired and irritated by closing techniques that are offensive, manipulative, unethical, arm-twisting tactics. Confirming the sale is the pinnacle of selling achievement. This program identifies strategies to make buying easy for customers by confirming using a non-manipulative, straightforward approach and presenting a practical, value-added solution. This refreshing keynote presents the five magic words used to effectively confirm sales. Sales expert Tim Breithaupt shares the newest trends in selling. His highly successful 10 Step Process gives you a practical, proven blueprint to close more sales, more often at higher profits. Using a lively blend of sales logic, simplicity and humor this inspiring book delivers the tools to build confidence and exceed sales targets. Take This Job and Love It, a book by Calgary sales expert Tim Breithaupt, explains how today's rapidly changing and intensely competitive business environment is shattering the foundations of traditional selling and sparking the emergence of entrepreneurial selling, a new breed of sales person - sales reps need not apply. Take This Job and Love It is one of the few books to be endorsed in Canada by David Chilton, noted author of The Wealthy Barber. It strips away the perceived complexities of selling and shows how to confidently navigate through an entire sales cycle. Using a simple, uncomplicated and frequently humorous approach, Breithaupt reveals the key competencies needed by today's salespeople. His 10-step Sequential Model of Professional Selling (Pg 10) provides a foolproof blueprint for sales success, and he shows how Five Magic Words (Pg 174) can help sales people double their close ratio. “Tim, you have created an improved sales culture within our organization that has facilitated effective target goal setting initiatives. Most importantly, you have helped us to position KPI's (Key Performance Indicators) solid measures of productivity which our managers can ulitize to preserve our return on investment and keep the sales momentum going.... Eecol Electric continues to use the talents and expertise of Tim Breithaupt and would strongly recommend any sales organization consider your services"
"I personally recommend Tim Breithaupt to anyone that wants to invest and develop their sales and management team. We have seen great utilization of the course concepts and it has paid dividends. The sales force is more confident and better equipped to face a very competitive and changing marketplace." "I have used the services of Tim -to train a number of my people from both the external sales force and internal customer service department. The materials and presentation skills have been outstanding and the results expected have been more than realized. Tim’s ability to provide our company with either a customized training course or have my people attend one of their open sessions if desired have fully satisfied our training goals. As of 1995, Tim has been accepted as the primary training organization on a national basis. This decision was reached after evaluating three other training organizations including a large industry specific firm in the US." "The staff from our company, that participated in your course, all agree that your technique is simple yet effective. Honest yet result yielding. Requires effort yet fun and enjoyable. Within two days of reviewing your material and putting into play some of Tim’s philosophies, our company was able to secure a major contract. This contract was a huge coup for our firm, as we were able to push aside our competition with honest, forthright selling techniques. We are confident that your seminar contributed, in part, to our success. Thank you!" "I would like to express my thanks for a seminar well done. Each participant left the seminar with an enhanced appreciation and awareness for customer service. Your dynamic style of facilitation and use of humour helped to make the material easy to comprehend and understand."